Not only Germany’s public infrastructure is in need of renewal. Alongside bridges, roads and railway tracks, many a heating system no longer runs smoothly. In many private households, chimneys are belching out too much CO2 and too much unused waste heat as the appliances are outdated. Year after year, the state heating system experts monitor the equipment in some 14 million buildings. And the last survey published, in 2013, shows that about 20 percent of the oil and gas boilers are over 22 years old, and some of them have actually passed 30. For all the exemptions and interim deadlines, many owners are now having to square up to buying a new heating system, and the choice is overwhelming. Where decades ago the big issue was whether gas was preferable to oil-fired boilers, today’s market for systems for heat generating, conversion and use is about as diverse as the auto industry. There are niche products of all kinds and in all manners of sizes. Most service providers have abandoned their former specialization in favor of a portfolio offering almost all the technical variations. But unlike autos, the focus is not on the image, form, function and technology of the SUV or convertible, the shooting brake or the town-car (and all the derivatives), but above all on the investment sum. And making certain the system has a long service life, is economic, easy to operate and ecologically in order. Alongside outdated machinery, the industry is also being boosted by the insulation and modernization measures already in place. 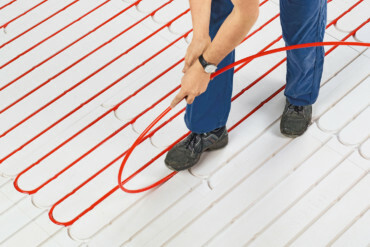 For countless heating systems today are now outsized and generate more heat than is needed, which leads to faster wear and tear on the installation. Possibly, users of the existing systems will need to replace them sooner than they would like. At present, condensing boiler systems based on calorific value are considered the optimal solution for private gas or oil-fired heating systems. Yet just short of one quarter of the systems in operation in Germany today meet this resource-saving standard. Such boiler technologies cool the flue gas as far as possible and exploit the heat still contained in the flue gas – through condensation. Energy generation using regenerative resources is becoming increasingly important here, and in private households this can entail a complex system that combines such sources with customary fuels. Not only fuels such as wood pellets have come on the market in recent years, but also heat pumps of various kinds that lock into heat from the earth, air and water. They tend to run on electricity or now also on gas. To make economic sense, they need to generate three times more heating energy than the drive power they require. Hot water supplies and heating support using solar-thermal systems has now become an established idea, not an offbeat notion. The heat is stored or energy converted using insulated water storage systems. Slowly, technologies such as fuel cells or cogeneration systems are out of their infancy and maturing. They enable a single energy source to produce both heat and power, which under certain conditions can be a compelling solution. In most instances, for all the subsidies these future technologies are still too expensive to be economical. At the other end of the product spectrum there are the stoves that for some time now have been finding their way back into houses and apartments. They allow you to enjoy heat as a visual experience like a hearth. Moreover, they form a good counter to the automated heating systems. The processes of storing and preparing wood required to fire your stove seem truly archaic. For that additional stage of complexity, stoves can also be combined with other technologies for heating and supplying hot water. Despite the new, binding energy consumption labels set out in the “Ökodesignrichtlinie” you still need to plan and compute things carefully. Because however astonishing it may seem, there’s no perpetual-motion unit, and most definitely among the heating systems of tomorrow. So what does the ISH offer in terms of changed leading CIs? How do brands and groups of makers interact? 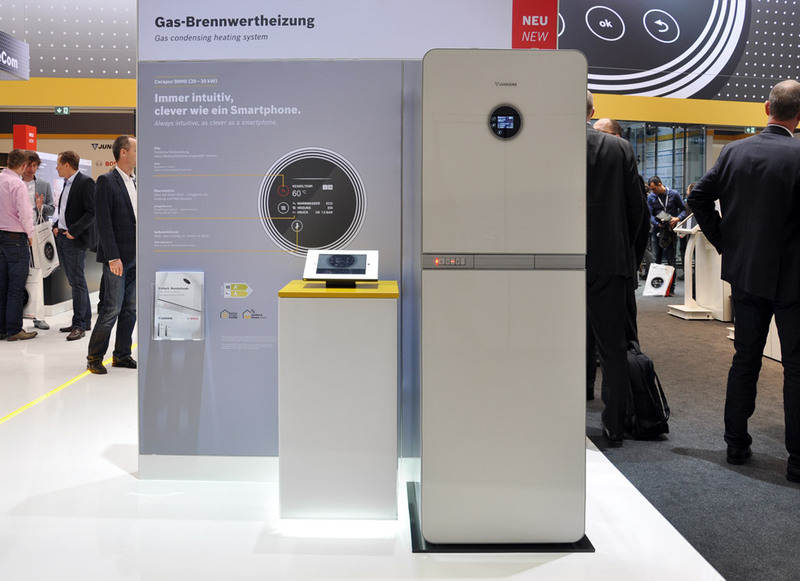 The Internet of things, which gives users digital controls for complex heating technology der Dinge, is now the norm among new-generation appliances. Apps, Smartphones and tablet PCs let you adjust your system and document the energy consumed. At the same time, networking enables engineers to do remote trouble-shooting, which is said to save time and costs. With the changed relationship between maker and client this creates, brand recognizability becomes increasingly important. This has had consequences for Bosch Thermotechnik, the world’s largest supplier in the industry, with sales of EUR 3.2 billion and a payroll of some 13,500 employees (status in 2013). Its Buderus brand (its dates back to 1731) and Junkers brand, (founded in 1895 in Dessau and one of the few companies that actually awarded contracts to Bauhaus in the 1920s, for example having its trade-fair booths designed by Joost Schmidt) are not well enough known among end customers today. Bosch was to date only active in the heating market with large-scale plants for industry is to be more strongly emphasized as a brand in coming years. Will the traditional brands really disappear? Buderus is essentially only of regional significance for the strategists. In the age of globalization the export share of 55 percent is evidently not important for the marketing buffs, but a severe deficiency that they do not intend to offset by investing more in advertising. Meaning that the Buderus and Junkers brands have hardly been positioned with any real thought for many years now and will in future be in jeopardy. 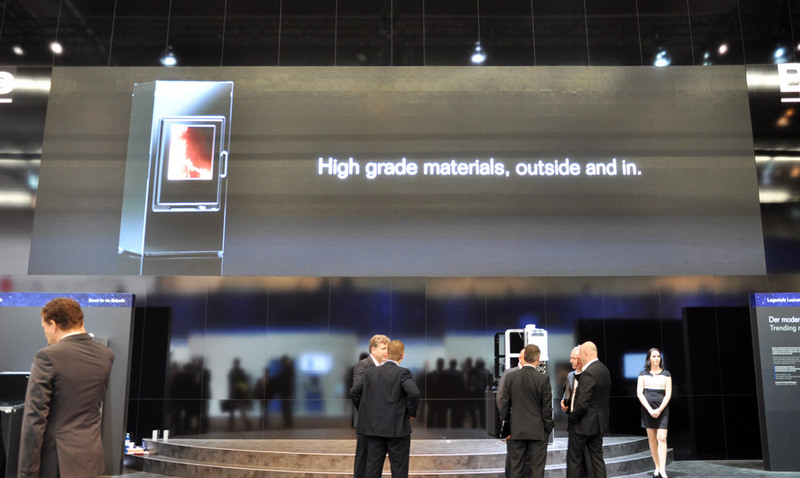 At Junkers, the booth presents the logos of the parent company and the subsidiary next to each other. They appear one above the other on digital user interfaces. The idea: The Bosch aura is meant to boost Junkers. Will this plan succeed? Buderus, hitherto a clear world of blue tones and also the defining element of the design of the outer panels, suddenly places its logo white on black on a monumental video-screen. The new products in the “Titanium” line also breathe the change. 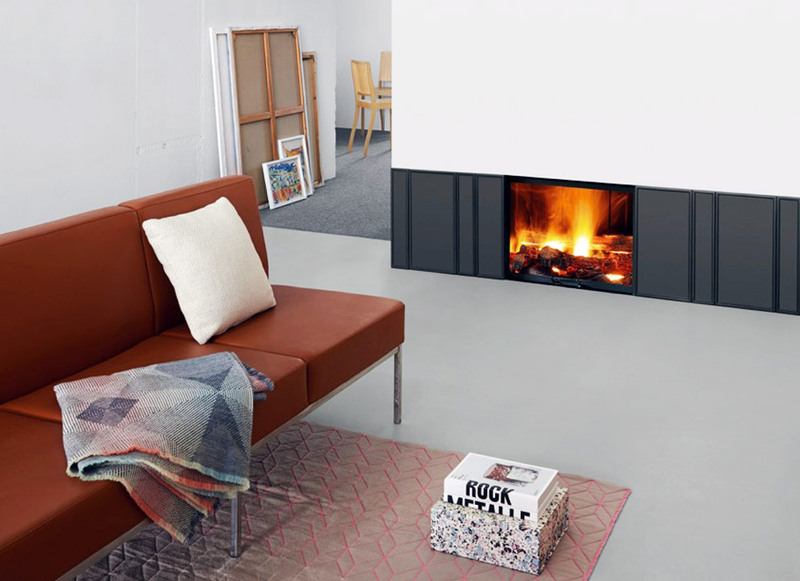 They are clad in black or white glass and indicate that in future heating technology is destined to be more appropriate for living room settings (at Bosch the appliances are called “Logamax”, at Junkers “Cerapur”). While Bosch’s household appliances long since boast clear designs, the subsidiary brands have a long way to go to achieve a homogeneous look. 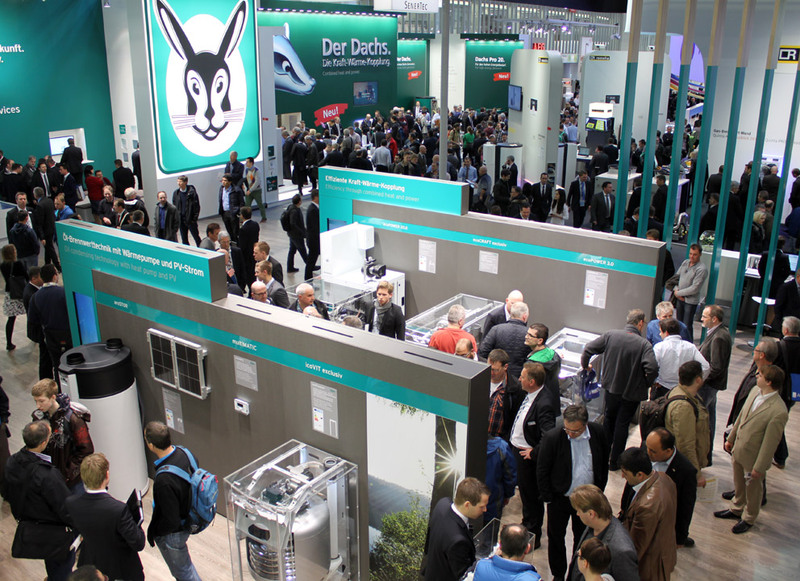 On the one hand, there are the new stoves by Stefan Diez (not that you would know from the info provided at the booth), on the other heating boilers and a new digital control system for the large units (“Logomatic 5000”). In a nutshell: However much the appliances may interact at the technical level and be calibrated to one another, they certainly do not speak of any sort of design coherence. 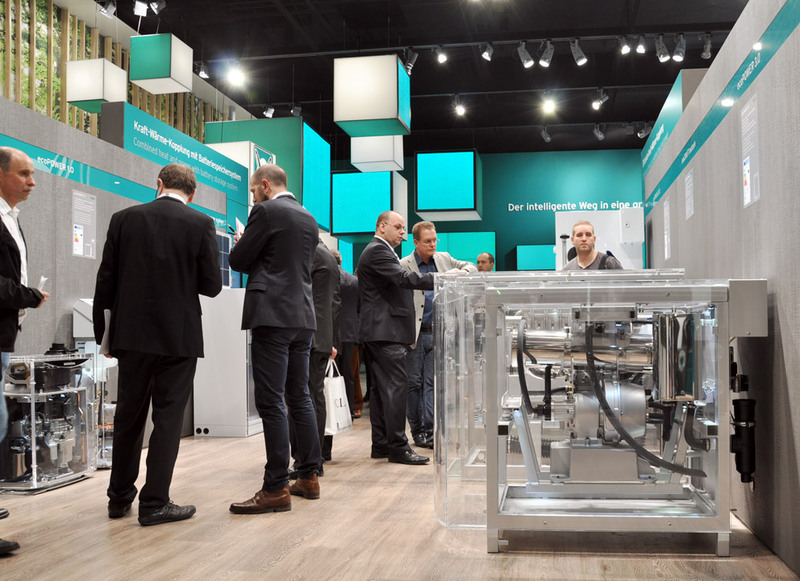 How different things are at the second-largest brand, namely the Vaillant Group (sales of EUR 2.38 billion, payroll of 12,000), which takes to the floor with Vaillant, the only brand active in Germany. Uniform colors and a well-conceived presentation for the booth give the family-owned company a sharper profile. Since 1899 the logo has been an Easter rabbit in an egg, and it was last given a revamp in 2009. In order to highlight networked efficient, self-adapting tech ology, the corporation dreamed up its own “Green iQ” label which is marketed as the firm’s “most sustainable and intelligent product series”. Symbols of this kind function, but the efforts don’t seem especially novel and are in fact a bit over-stretched. Especially when it comes to safety for the future. After all, tomorrow’s innovations do not adhere to today’s design forms and conventions. But overall the mixture of renewal, research, information and entertainment on the booth is nicely balanced, even if afterwards it is hard to remember the one or other individual appliance or technology. 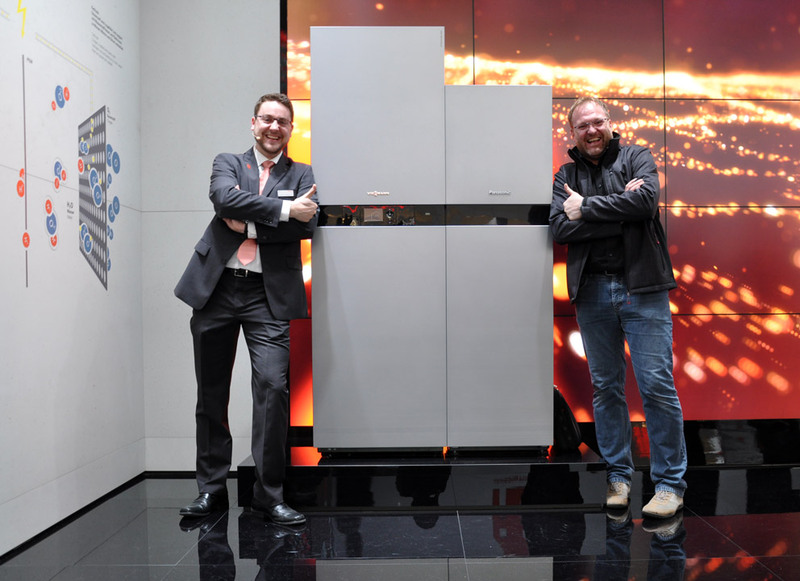 Viessmann presents proudly its new fuel cell heating systems – pretentiously named “Vitovalor 300”. With this product, you should save up to 40 percent of energy costs. The current no. 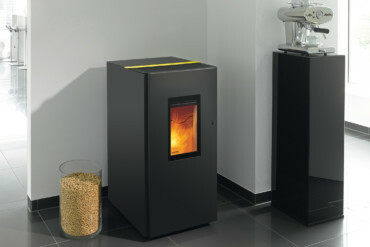 3 among the German heating technology corporations is Viessmann and seems streets ahead of its rivals in design terms. 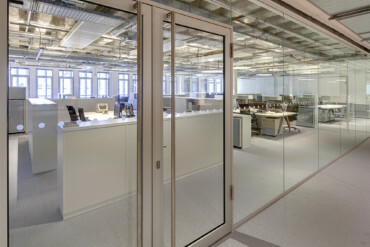 With sales of EUR 2.2 billion and currently 11,500 employees, like Vaillant it remains family-owned and covers the entire spectrum of heating technology. 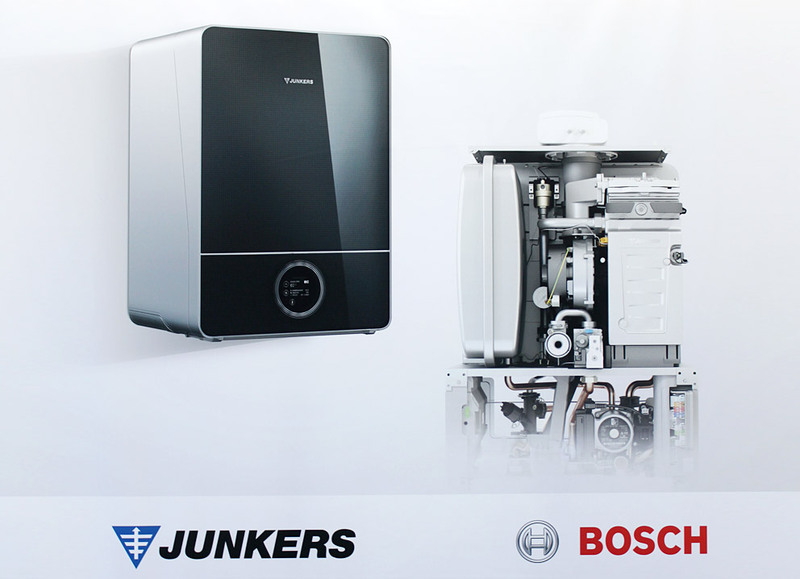 Despite the related diversity, Viessmann focuses on three main themes: “Hybrid”, “Connect” and “Power”. The booth design corresponds perfectly with the trade-fair hall, designed back in 1967 by Rambald von Steinbüchel. Three towers, each eight meters high, create the trade-fair eye-catcher. “Hybrid” stands for heating plant that combine condensed heating and heat pump units, each fully automatically selects the most favorable operating setting depending on the outdoor temperature and energy price. 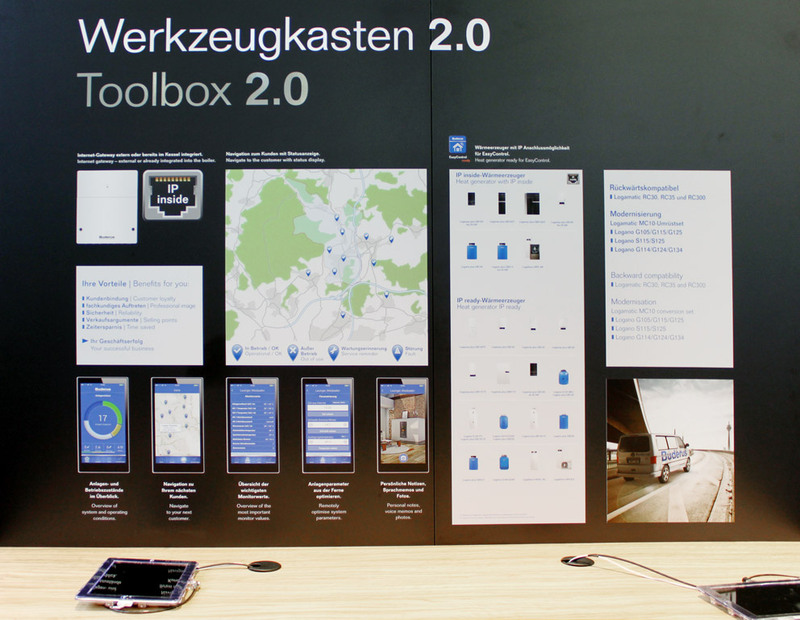 Under the slogan of networking, the company spotlights building energy management per Touch display or App. The topic of “Power” highlights electricity generation, use and storage, with the cogeneration handled by a Stirling engine and a fuel cell from Panasonic. Viessmann markets appliances for ne-build apartments requiring little heat that deliver power and heat generation using a dual unit (“Vitovalor 300-P”) and uniform flue-gas disposal. It’s regularly astonishing how logical and sure the design modules go together (from the remote control through the App user interface, from different objects and software interfaces to industrial-scale plants) – thanks to the diverse and yet coherent formal idiom courtesy of Phoenix Design. And over all of this we can still sense the spirit of Anton Stankowski who back in 1960 created the brand image and evidently has been well understood by his various successors to date. An unprecedented case. On entering the hall where the stove manufacturers exhibit, you step into a completely different world. 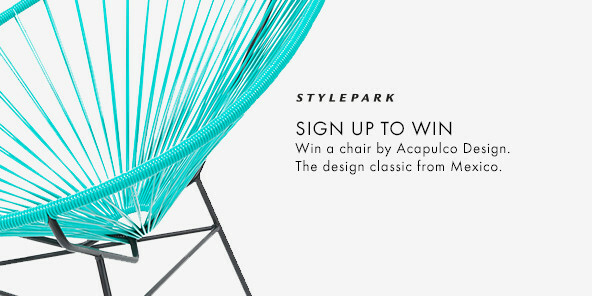 Only very rarely does design meet creative craftsmanship here. 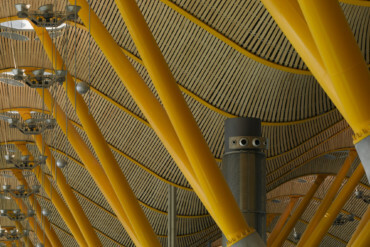 The shape and materials used are much of a much. Here, the product world of small grates, lathed handles and material frills encounters pleasant old settings that you might be forgiven thinking industrial and product design had long left behind. Technologically speaking, the stoves have to keep up with the heating systems, are long since networked with them, and are part of the large home heating machine. Yet most of the exhibitors do their best to make you forget the fact. Here, no shape is too crude, no display too ornate. 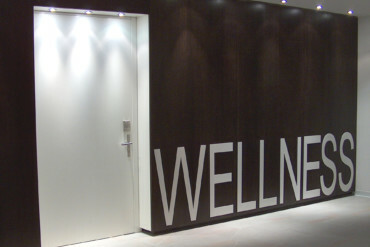 Brand is the key issue for what are mostly small companies, and with a primarily traditional crafts outlook on the subject at that, whereby logos get engraved, screwed on as plaques or stamped into the metal. 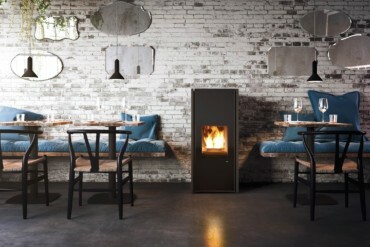 The exceptions are all the more gratifying: for example Swiss manufacturers Attika Feuer, which not only fields purist stoves (the brainchild of designers Stefan Stauffacher and CEO Erwin Hauenstein), but also prioritizes easy controls and low flue gas levels. In one of the lines, the flue gas then goes through an afterburner that cleans the fumes. Unlike the heating technology giants, the emphasis is no on App controls. Which would hardly be meaningful for a stove. On the contrary, Hauenstein constructs his stoves such that users can hardly go wrong. An original idea in the opaque heat-generation market.